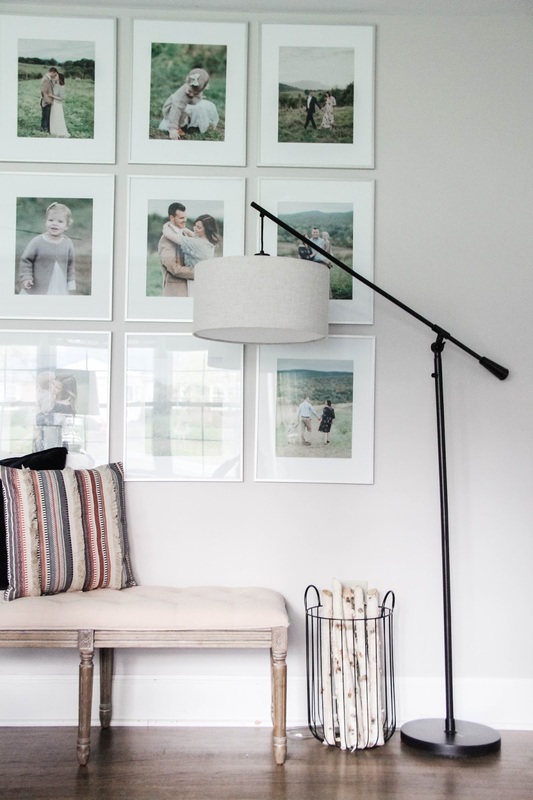 Have you been envisioning a large gallery wall to fill that blank wall in your home, but just don't know where to start? 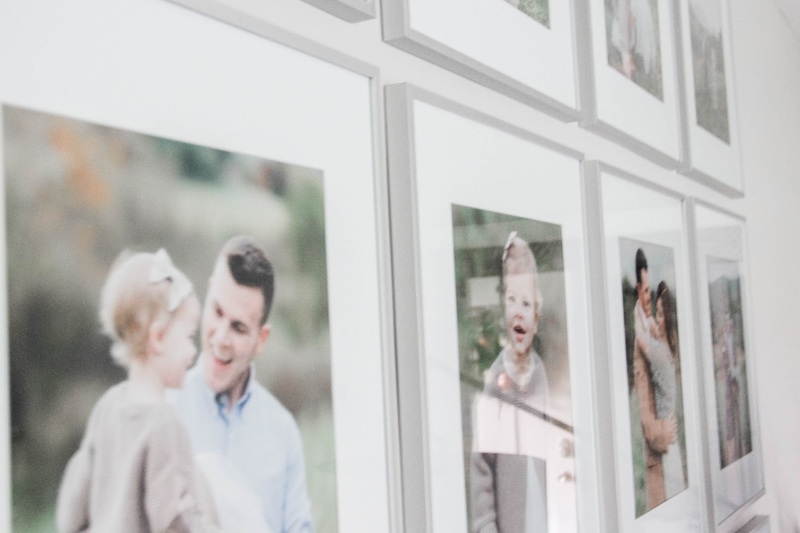 Today, I hope I can give you some tips to planning out your ideal gallery wall, giving you the boost to make it happen. And I promise, it's going to completely transform your space. No wall ever looked so good as one decorated with photos! You all have been so kind about my gallery wall that I originally shared back in February. I have sense made some changes to the layout of furniture in our family room, and the gallery wall has a slightly different look these days. Since I get lots of questions from you about how I planned it out and made it come to life, I wanted to take some time to share my process + to show you the new space! 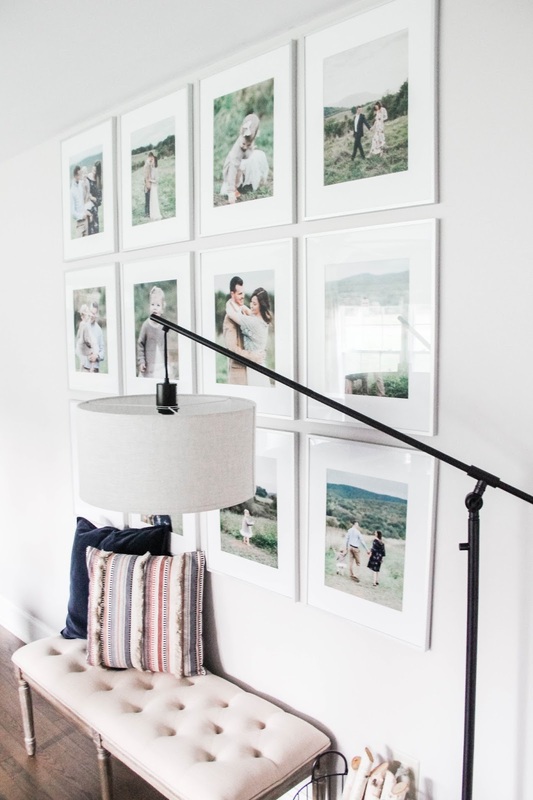 The first step to putting your gallery wall together is to begin by assessing your space. How big is the wall you have in mind? The size of the wall will ultimately determine the size of the frames. You want them to complement one another for a flawless look. 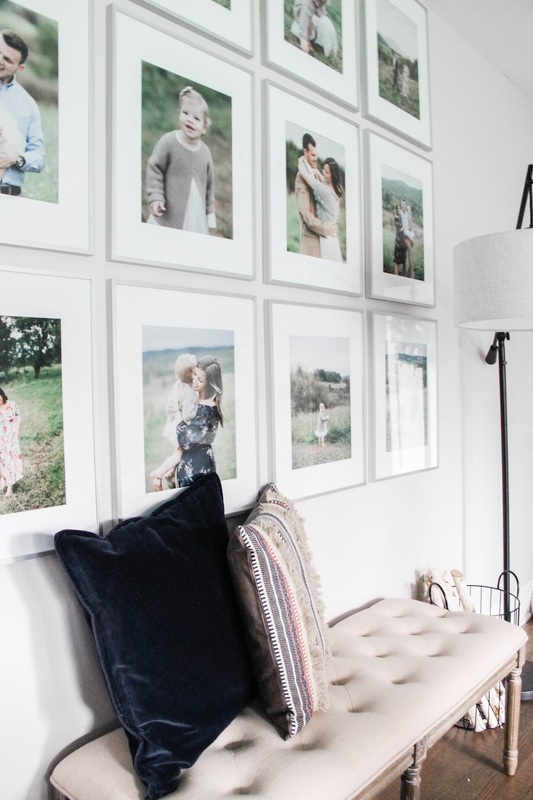 In my home, my wall is large, and I knew I wanted an almost floor-to-ceiling look. I didn't want the entire wall covered in photos, but I wanted at least half of it dedicated to my gallery wall. A little calculating later, and I determined that three rows and four columns using 16x20 frames would make for the perfect layout. Next, I wanted to make sure the photos themselves were the main feature, not the frames. So I scoured the internet for frames that had a thin, metal edge, but also offered a matte option. 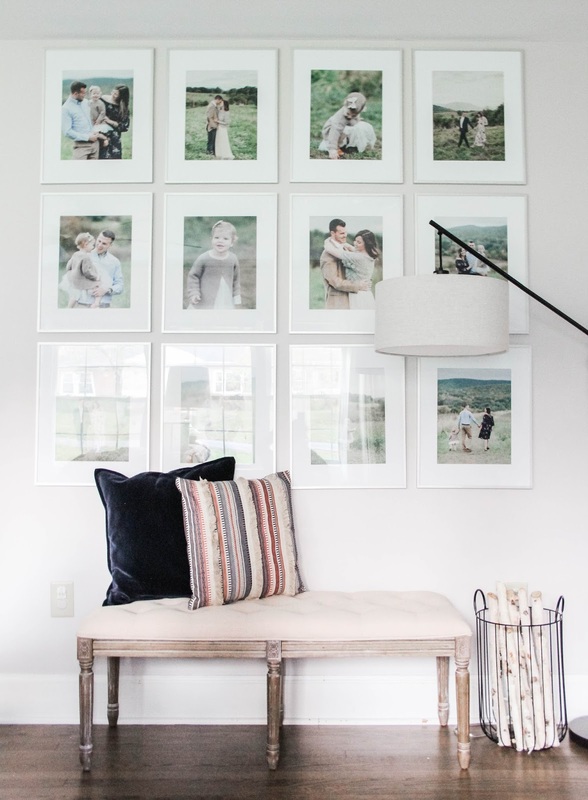 When hanging a lot of photos close together in rows and columns, it's important to create some visual space, and that's exactly what a matted photo frame gives you. 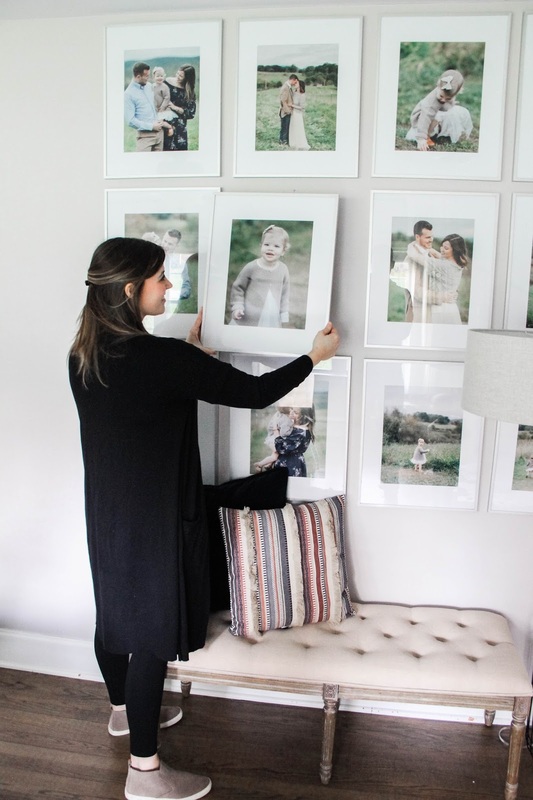 Once I found my matted frames in the size I needed, I started the process of picking my photos. 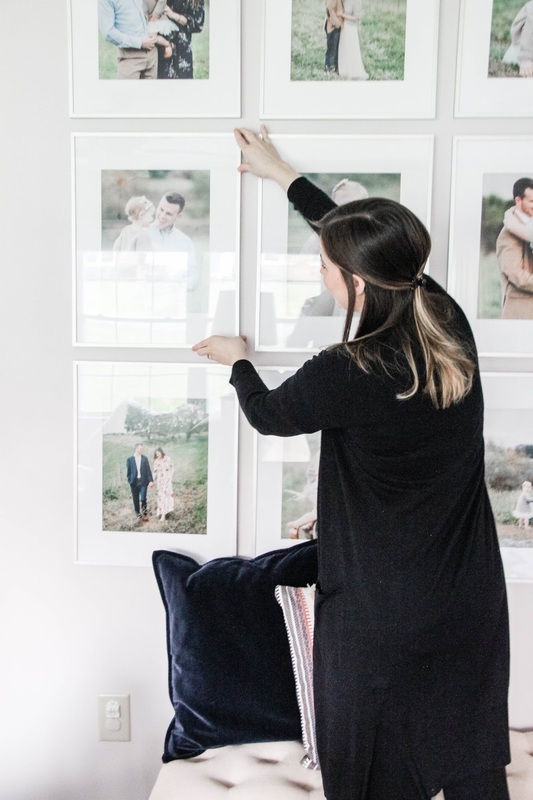 When selecting photos for a large gallery wall, I highly recommend using photos that have been professionally taken so that you have high-resolution in the final product. You don't want large and blurry photos. The photos I selected were printed as 11x14 prints. We combined some older photos with our most recent family photos. And because we have used the same photographer over the last two years, all of our photos have a very similar aesthetic. That makes choosing photos so very easy. If you're not sure that the color quality of your photo selections is similar enough, I suggest opting for black and white prints. That's always a guaranteed classic look, and you can't go wrong with it! Printing the photos is next up on the to-dos. I've always used Mpix to print my photos; the quality is exceptional and I am always extremely pleased with how they look. From the color to the photo paper, I've always ended up with bright, crisp photos ready for hanging. I started hanging from the ceiling down, but spaced it all out before putting nails in the wall to make sure I had enough room. 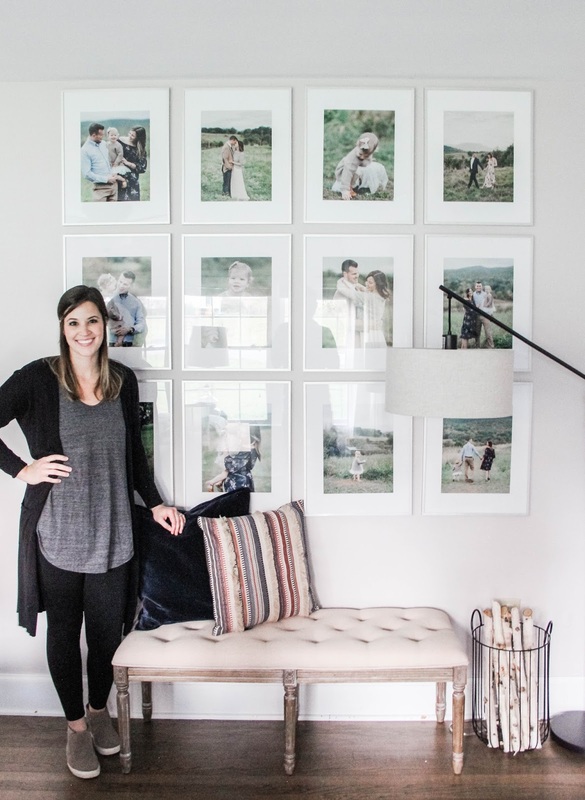 I hope this provided you some insight for beginning the planning process for your very own gallery wall! 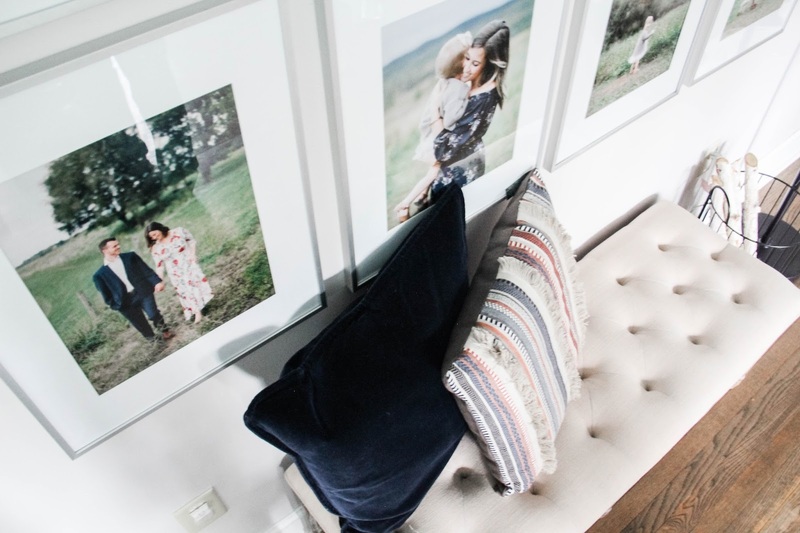 For more home inspiration, celebration of the every day, and bit of fun be sure to head to my life + style blog, Darling Do. And let's connect on Instagram, Facebook, and Pinterest! Hope to see you there! And a big congratulations to Jennifer Finn on winning the Pemberley Handmade bow giveaway! I've emailed you, please make sure to reply within 24 hours! Affiliate links were used within the post. Thank you for supporting this blog!